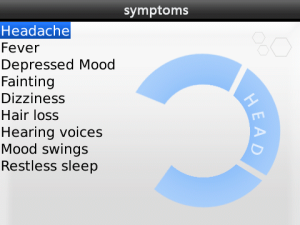 SympID Lite for BlackBerry is a free guide that can help you to learn about your medical symptoms. Just simply turn on SympID and point out the part of the body that is troubling you and With just a few clicks, SympID will provide you with possible causes for your symptom. The app is free, but with ADs. For an AD Free experience, you need to buy SympID standard edition. Download the SympID Lite for FREE from appworld.